Tawny from Wig America GORGEOUS! Tawny from Wig America GORGEOUS! Tawny from Wig America GORGEOUS! All my wigs fit the average head size, but will adjust to fit a slightly larger head as well. They all have Care Instructions printed on the tags. 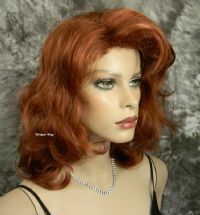 Gorgeous New TOP QUALITY Wig from the Mona Lisa Collection. This is called Tawny. This is so fabulous and gorgeous! 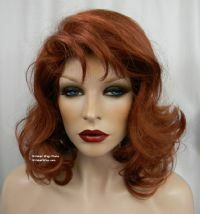 This has perma-teased roots for volume, and is slightly wavy full wig, layered with long sweeping bangs. Overall length of this is 11 to 18". You can part this anywhere you like, the roots feel like they are teased for added height and volume. .. This looks and feels like human hair, but is actually synthetic fiber .. very easy to care for. This is one of my favorite wigs! 1-black, 1B-off black, 2-darkest brown-almost black, 4-dark brown, 6-chestnut brown, 8-light chestnut brown, 10-medium golden brown, 12-light golden reddish brown, 14-light golden brown, 15-golden reddish blonde, 16-honey ash blonde, 19-light strawberry blonde, 22-champagne blonde, 24-light golden blonde, 24B-light butterscotch, 27-strawberry blonde, 27A-light auburn, 27C-light ginger, 30-medium auburn, 33-dark auburn, 130-fox red, 18/22-light ash brown and champagne blonde frost, 24/14-light golden blonde and light golden brown frost, 27CH24B-Butterscotch, 24H613 - light golden blonde with pale blonde highlights, 31T130-auburn mixedand tipped with fox red, or R147- light auburn, light ginger and wild fire. Pictured is color 27C - Light Ginger, 24-H613 - Light Golden Blonde with Pale Blonde Highlights, 130 - Fox Red - AS PICTURED, 6H27C- chestnut brown with ginger highlights, Henna Red, Orange Spice, or Raisin Glaze.